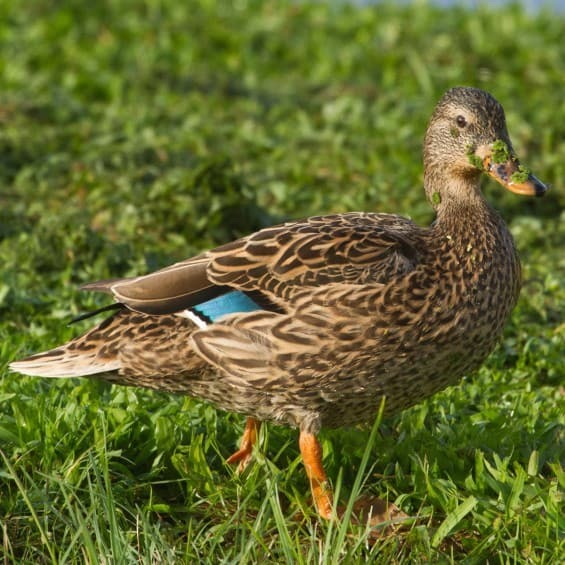 Koloa are similar to and probably derived from the Mallard. Both sexes are mottled brown, resembling a small dark female Mallard. Their flight feathers are green to blue and bordered on both sides by white. Their feet and legs are orange. The bill is olive green in males and a dull orange or gray with a dark saddle in females. Males are darker than females and tend to chestnut coloring below. Koloa quack like Mallards, but softer and are not as vocal. There are few pure Koloa on Oahu, most are Mallard-Koloa hybrids. You will probably see only hybrids at Ka’elepulu Wetland. Koloa eat a wide variety of food including snails, earthworms, dragonflies, algae and wetland plants. They are listed as an endangered species.